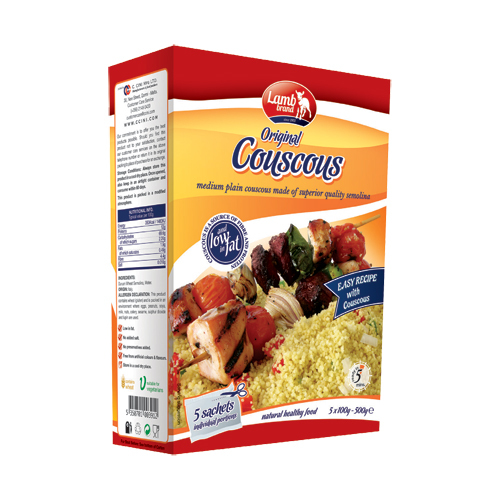 Couscous is a dish made from tiny granules of durum wheat and most of it is "instant" or quick-cooking. 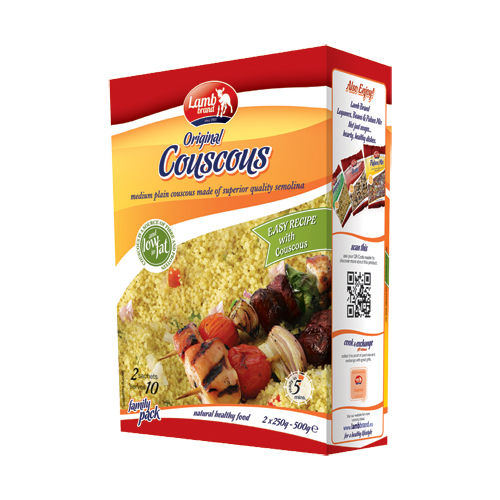 Couscous is closely related to pasta, as durum wheat, ground into semolina flour, is the same type of wheat that is most commonly used for making pasta. Couscous originated in North Africa, where it is traditionally prepared as part of a meat or vegetable stew seasoned with cumin. Today, couscous is found in many cuisines, including much of the Middle East and various Mediterranean cuisines, as well as the United States and western European countries. Although couscous was traditionally hand-rolled, these days it is made by machine. Coarsely ground wheat (semolina) is moistened and tossed with fine wheat flour until it forms little round balls. Preparing instant couscous is quick and easy. The dried couscous is added to a pot of boiling water or stock, the pot is then covered and the water is absorbed into the couscous in about five minutes. There are various ways how one can prepare couscous and can be both savoury and sweet depending on the ingredients used. Couscous can be prepared with lemon, toasted almonds, peas, raisins or currants, even apples or apricots. Couscous originated in Morocco and is composed of tiny balls of dried semolina dough. A culinary ingredient appropriate for use in place of rice or quinoa, as a meal on its own or to compliment your main dish. Including couscous in your diet provides several health benefits. A 1 cup serving of couscous provides only 176 calories, or 8% of a standard 2,000 calorie diet. This would be far fewer calories than a cup of rice or quinoa, which provide 205 and 254 calories per cup. A 1 cup of couscous adds 6g of protein to your day, or 12% of the daily recommended amount. Protein is a nutrient needed for muscle building after exercise and sustaining energy. A perfect fit for today’s health–conscious eaters. Couscous is extremely versatile and light. Add couscous to your soups or eat it as a side to compliment any beef, lamb, chicken or vegetarian dishes. 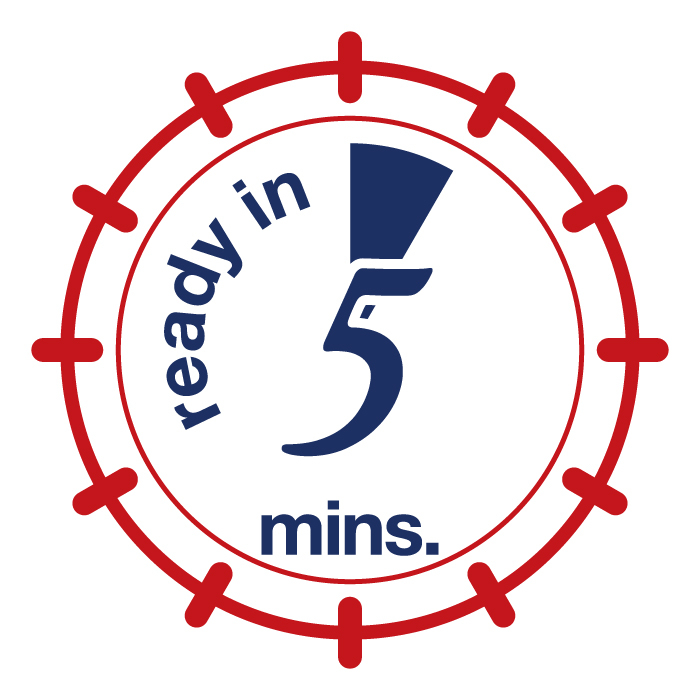 Prepare it for your lunch break at work in just 5 minutes by adding water and allowing it a few minutes to be absorbed. Couscous originated in Morocco and is composed of tiny balls of dried semolina dough. A culinary ingredient appropriate for use as a meal on its own or to compliment a main dish. Including couscous in your diet provides several health benefits. Couscous is often used as a side to meat recipes. Can be eaten cold, as a pre prepared salad or warm. Create a lovely beef, lamb or pork dish with sauce and poor it over your couscous as an alternative to rice. There are plenty of ways to incorporate your meat and couscous. Try a spicy Moroccan style recipe or a cold Mediterranean salad mixed with plenty of fresh vegetables. Add some grilled beef Kebabs on the side or use the couscous in a beef stew perhaps, cook your meat in an Asian style curry sauce and serve it over your cooked couscous. Get creative with your couscous & meat dishes and try out a whole new range of simple recipes from our site. Click here. Couscous is quick to prepare. Just add some water and simply give some time for it to be absorbed. Couscous is tasty alone however mixing it with vegetables increases its healthy properties and makes it more of a filling, hearty meal! Prepare a couscous and vegetable mix stuffing with a few spices to make the mixture truly pop. Use this veggie and couscous mixture to fill up your green, red or yellow peppers. Put the stuffed peppers into the oven for around 20 minutes. This makes for a healthy, quick, original and tasty vegetarian meal. Use vegetable couscous as part of a vegetarian couscous salad to take to work, on a picnic or for a day at the beach! For a nice warm dinner why not try a baked vegetable couscous with a mixture of pumpkin and spinach. Ready in just 30 Minutes with minimal effort! There are plenty of ways to be creative with couscous and veggies! There are many couscous and chicken recipes to satisfy anyone’s tastes. If couscous is your main ingredient then why not toss in some chicken strips to make a more filling salad? Add some cherry tomatoes, chick peas, green onions, basil and olive oil to make a tasty Mediterranean couscous salad for lunch, or take to work or school. If chicken is your main ingredient than why not grill a chicken breast with some olive oil, oregano and grate lemon zest? As a side stir up some couscous with tzatziki, cucumber, yellow peppers, mint and spring onions. Add some dill to the mixture and before you know it you have an amazing chicken breast and couscous meal full of zesty flavours. Why not put an oriental twist on your cooking and mix up a chicken and pineapple stir fry with a side of couscous? Mix the chicken with some peppers, soy sauce, carrots, canola oil and garlic. Add Pineapple chunks towards the end and a fluffy side of chicken couscous. Couscous goes well with anything really. Try Lamb Brand couscous for fish and prepare a couscous salad as a side to some tasty fresh fish, perfect for the summer season. Choose a nice tuna steak fish from your local fish hawker. Sprinkle with some mint, lemon juice, sea salt and pepper and cook on the grill or BBQ for a few minutes on each side. Boil some couscous as a side. Leave it plain or add some lemon juice, cherry tomatoes, cucumber, a drizzle of olive oil, basil leaves and rucola. If you want a fishy dish to take to work or school then why not boil some couscous and add a can of tuna, olives, onions, capers, garlic, basil leaves and a dash of tomato paste for a real Mediterranean style lunch.